I have been looking at the records for members of the Latin Mass Society who give Middlesbrough as their diocese. The total membership in the Middlesbrough Diocese is 53, made up of 10 couples, 11 female single members and 23 single male members including two priests. The biggest concentration of members is in York, where there 19 members. Hull and Middlesbrough have 5 members each. Of the remaining 24 members 8 live north of the North Yorkshire Moors and 16 to the south. It is gratifying that there are several new members with none dropping out in the last year. This is contrary to the national trend where membership is declining. There will be a pilgrimage to the Dome of Home on Saturday 2nd August. The Dome of Home is the name popularly given to the Church of Saints Peter, Paul and Philomena at New Brighton in the Wirrel, which is a shrine to the Blessed Sacrament in the custody of the Institute of Christ the King, Supreme Priest. The timetable is as follows: 11.30am Solemn Mass, 1.45pm Talk, 2.30pm Tour of the Shrine, 2.00pm Benediction & Veneration of relic of St Philomena. This is a Latin Mass Society pilgrimage and it would be good if the Middlesbrough Diocese was represented. If you do not know why the church is named the Dome of Home, take a look at this picture! Rorate Coeli carries a report that the Priestly Fraternity of St Peter is to get a new permanent base in Munich. As from 1st September, Fr Christian Jager of the FSSP will be in charge of the Damenstiftskirke Sankt Anna in Munich, where there will be daily Mass in the usus antiquior. 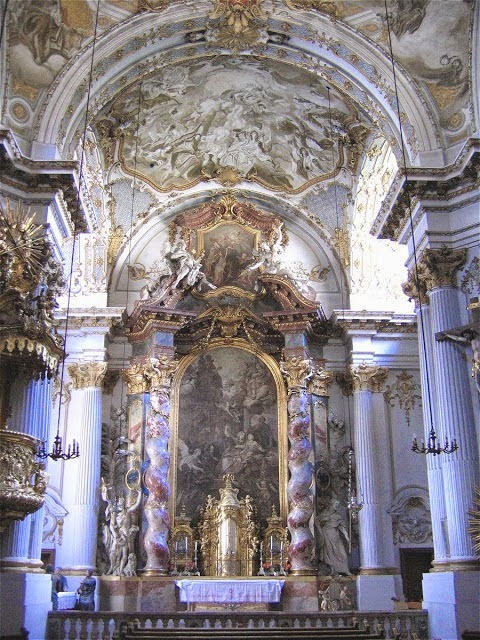 What a lucky man Fr Jager is, to be sent to a church like this! In Rememberence of those who Died in the First World War. Monday 4th August marks the centenary of the outbreak of the First World War, an event which resulted in a loss of life that is measured in millions. There will be a Solemn Requiem Mass for all those who died in the conflict at 6pm on Monday 4th August at St Wilfrid's Church in York. A special effort is being made to put together a choir so that there can be a polyphonic setting for this very solemn Mass. In the last few weeks, two priests have been ordained in the Ordinariate of Our Lady of Walsingham. If my tally is correct, this brings the number of priests in the OOLW to 86. Regrettably, the Ordinariate have not got round to publishing anything like a directory, so statistics are hard to find. There are reports of the number of laity increasing here and there in twos and threes, and I am guessing that the total in now around 1,600. If this is correct, there is more than one priest for every 20 lay people, which is quite a remarkable ratio! However matters remain quite difficult for the Ordinariate, as the geographical spread of the clergy, does not always match the spread of the lay members very well. For example, in Scotland, there is one priest is covering three groups that are scattered over a huge area. In some parts of the south of England, Ordinariate clergy are so numerous that some are covering diocesan parishes full time and rarely get to work with Ordinariate groups. It would be difficult for the Ordinary to insist that the clergy move to where the need is greatest, as many of them are married, and such moves would cause a great deal of family disruption. It is still a little soon to predict the future shape of the Ordinariate of Our Lady of Walsingham. One of the issues that provoked Pope Benedict to make the provision was the prospect of the ordination of women bishops in the Church of England. This matter has rumbled on for about ten years, but a conclusion is likely soon, following the expected vote in the C of E synod next week. This could induce some C of E members who are wavering to make up their minds. For those who are interested in such things, the annual general meeting of the Latin Mass society will take place next Saturday at 11am in the hall associated with Westminster Cathedral. There will be a solemn Mass at 2pm in the Cathedral. I have been looking at Vatican statistics for Korea. The Catholic population is 5,393,000 which is 10.7% of the total population of 50.2 million. There are 35 bishops in 15 dioceses, and they have 4261 priests. The most interesting figure is that there are 1884 seminarians. By my estimation this should translate into at least 250 ordinations per year, and a steadily increasing number of priests. Korea is broadly similar to England and Wales in terms of population and Catholic population, and yet it can look forward to about ten times as many ordinations each year. The Koreans must be doing something right. The major traditional orders of priests are having had a bumper crop of ordinations this year. Twelve men were ordained to the priesthood in the Priestly Fraternity of St Peter, eight in the Institute of Christ the King Sovereign Priest and three in the Institute of the Good Shepherd, giving a total of 23. This is the highest number for several years, if not the highest number ever. Alas, there are none from England or Wales amongst this year's priestly ordinations, but there is the prospect of two next year, and several in the years to come.